Right before I stuffed anthrolume into the box to send it down to Berkeley, I added this feature that allows me to use sets of related colors instead of random colors for animations. While I managed to hack the facility into the software before I shipped it, I needed to create a bunch of these color sets. So during my little southern California vacation, I’ve been getting those together. I wrote a little program in C#/WPF that can obtain artist-created color sets from Adobe’s awesome Kuler site. My program obtains the top-rated 1000 color sets, then keeps the sets that meet certain emipirical minimum luminance requirements. Then the program generates the static data that gets compiled into the anthrolume suit computer. 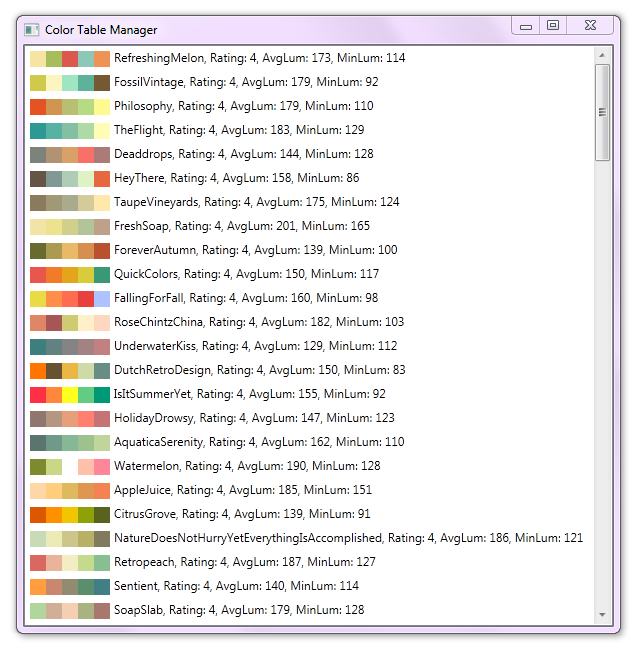 // Total of 133 color tables. So now I’ve got a nice set of 133 color sets in there to spice up the animations. Will test all that when I get to Berkeley on Sunday. We leave for the Burn on Monday morning! Today I shipped anthrolume down to California, where I’ll meet up with it a day before Burning Man. 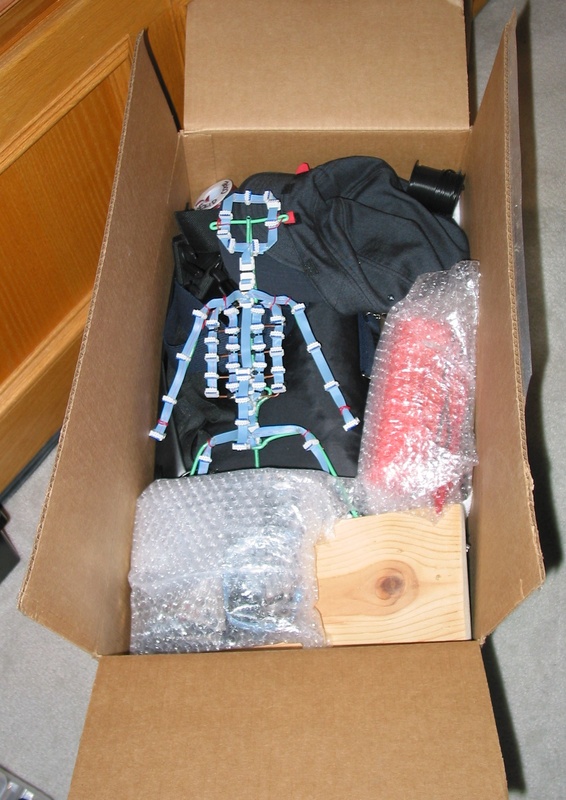 The whole suit is in the box, along with MiniMe, which you can see on top there. I was still hacking the code until the minute I put the control computer and MiniMe into the box. At the last minute I added this cool feature, color tables, that I hope to be able to post a demo of soon. Basically it chooses colors from tables of predefined colors that I have created that look nice together, rather than the high-saturation-random colors I have been using up to now. The results really are nice. So now that the mechanism works, I’ll add a ton more color tables to the software, then update the control computer at the Burn. It’s doubtful that I’ll be able to post any pictures or videos while I’m at the Burn do to extremely limited (or nonexistent) internet access there. But I’ll be sure to share when I return after September 6. One finishing touch on the anthrolume suit was to try to secure the LEDs. They’re pretty expensive, and I’ve only got five extras, so I need to keep them from falling off as I tromp around Burning Man at night. A welcomed last-minute donation of 150 orthodontic rubber bands was made by my awesome family orthodontist Dr. Wisanu Charoenkul is going to help. 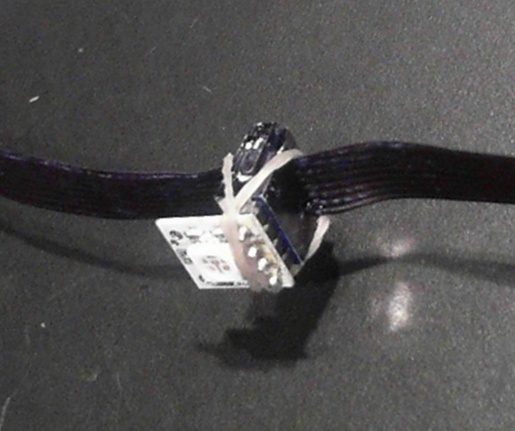 Now for each LED I’ve got two of these tiny latex rubber bands lashing the LED onto the ribbon cable and IDC connector. Thanks Doc! Modern computer user interface design generally eschews modes. Nevertheless, modes are rife in physical devices, especially small ones with a scarcity of inputs and outputs. Such is the case with my austerity-plan anthrolume, and I was forced to make a modal interface. But I did a few things to make the modal UI less objectionable, which are demonstrated in this video.